About 60% of the territory of South Sardinia is within the province of Cagliari. Hotels in Decimoputzu Its landscape varies from the superb beaches of the south and east coasts, to the hidden mountainous areas in the central part and to the open and cultivated plains of the Campidano. Decimoputzu lays right here, in an area intensively cultivated and populated, at least compared to the rest of the island. The nearest city is Cagliari and roads are quite good, allowing quick transfers to the coast. Here some views can be really spectacular. The road from Cagliari heading east to Villasimius, for instance, is simply superb. Hotels in Decimoputzu At every corner the view opens to a new portion of the coast, with your sight first spreading towards the horizon and then focusing at the beach just lying beneath. After a few of these sights, you get to Villasimius, home of one of the most beautiful beaches in the island. Similar sceneries are found along the coastline west of Cagliari, on the road from Chia along the gulf of Teulada, towards the beach of Tuerredda. Also, impossible not to mention the beaches north of Villasimius, on the west coast: Cala Pira, Cala Sinzias, Costa Rei and Feraxi-Colostrai-San Giovanni, are impressive both for the colour of the sea and for their size stretching in some cases for almost 14 km! Last but not least, the beach of Poetto right in the city of Cagliari. Here you may taste fresh urchins and other seafood in one of the kiosks along the beach. From spring to fall pink flamingos populate the ponds along the beaches of Chia, Poetto and Colostrai (in Poetto their population is permanent). Bring your camera along as you can easily get close enough to capture great images. If by any chance you get bored of sunbathing in such beautiful beaches, move away from the coast and explore the inland areas of Sette Fratelli or Gutturu Mannu natural reserves. Views can be breathtaking too and activities range from trekking to horse riding, cycling and 4WD excursions, with canyons and waterfalls in abundance. 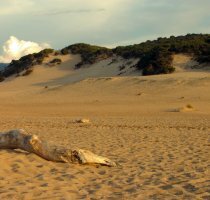 Combined they offer you 127,000 hectares of wild Sardinia. Just avoid hot days and bring plenty of water along with you! Other naturalistic areas are Molentargius in Cagliari and the marine reserve of Capo Carbonara in Villasimius. Worth a visit is Nora, 40 minutes drive west of Cagliari. 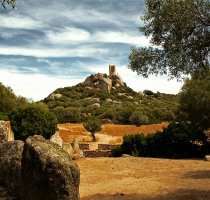 The ancient roman site is the most important in Sardinia. Its location is also superb, as it lies on a thin strip of land stretching out from the beach of Pula and ending with a cliff at the top of which is the tower of Coltellazzo.